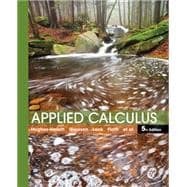 The 5th Edition of Applied Calculus continues to exhibit the same strengths from earlier editions including a focus on creative conceptual and modeling problems and the "Rule of Four", an emphasis on concepts and modeling, exposition that teaches a flexible approach to technology. This issue provides readers with deeper skills needed to apply calculus on the job and highlights connections with real-world concerns. The problems and exercises are challenging and provoke deeper thinking to help apply math in new ways. The material is presented in a way to help readers decide when to use technology, which empowers them to learn what calculators/computers can and cannot do. "Calculus is a way to torture students, I'm sure of it." Applied Calculus: 5 out of 5 stars based on 1 user reviews.